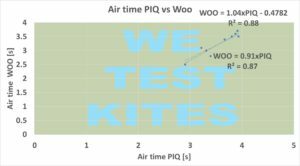 Home Kite accessories North PIQ vs Woo sports, jump height and air time (part 1). 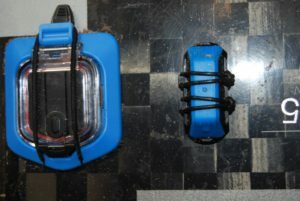 After the Woo and the Xensr there is again a new tracking device for kiteboarding; PIQ. Supported by North Kiteboarding and introduced weeks ago, a lot of people wonder why? 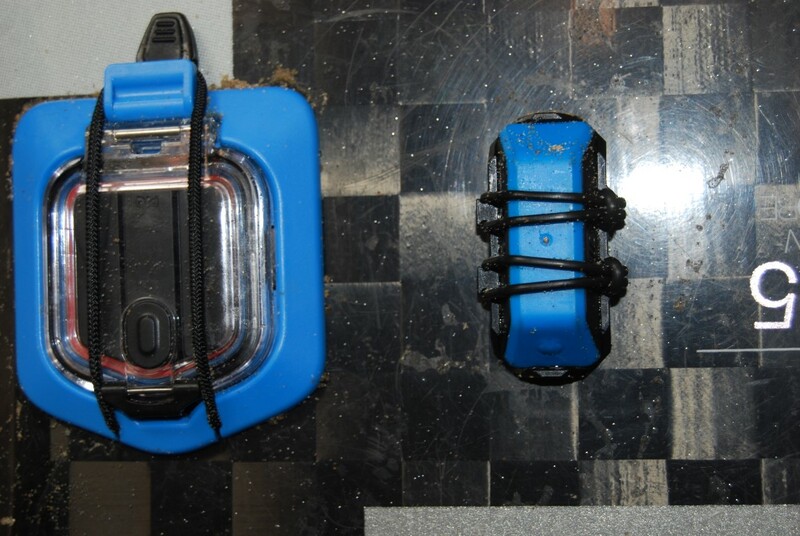 Why another tracking device? Although an interesting question, this won’t be the topic in this review. No, the most obvious question we dealt with is if this device comes up with similar results as the Woo. The Xensr clearly wasn’t comparable in our previous test, but for the PIQ looks perfect so far! This review is limited in more than one view. First of all we just focus on comparability with the Woo sports in height and air time. Seconds we just had about 20 knots of wind during the test, meaning the height range is quite limited (maximum just above seven meters) and only 9 jumps with relevant elevation. Since we are all so curious on those first results, we just start with these limited data and in a few weeks time we will have an second go with heights ranging a lot further. Speaking of data, getting all data out of the Woo is already a lot of work, but at least we can see them. 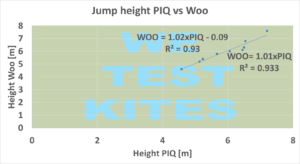 For the PIQ we looked at each individual data from each jump from the PIQ. Normally the PIQ just shows a summary (maximum, average et cetera, as shown below). The results are quite stunning. The relation is near perfect and can -in our test- be seen just as similar as having two Woo’s on one board. 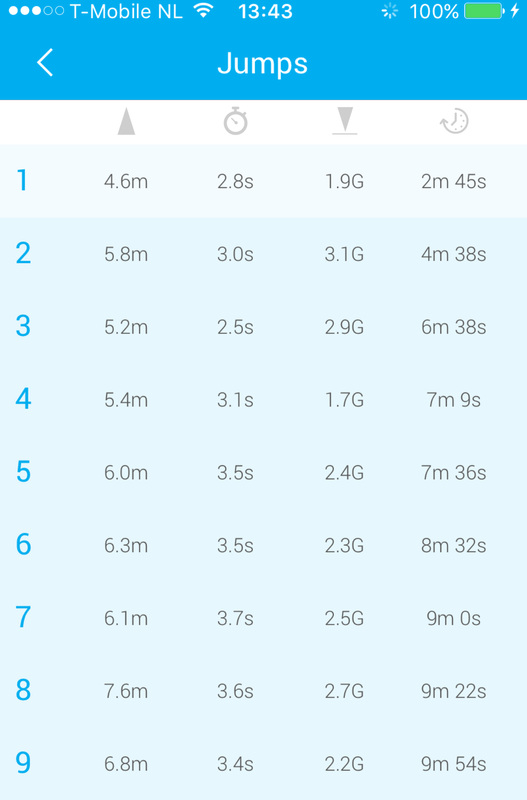 Both the amount of jumps (9, deliberately executed this amount for the test) and the moment (within 1 second) the jumps where recorded are as one tracking device can be to another. Of course below roughly 4 and above 7.2 meters not much is proven yet, but it looks very promising. The statistics on air time look a bit less perfect than the height data. This may have to do with the limited amount (9) of data pairs. Although the test is very limited, it still shows that the PIQ is showing similar results for jump heights and probably not much different for air time from the Woo. A second comparison needs higher jumps with more wind. In our area the wind predictions do not look to promising, so we expect to have some more results only in a few weeks. 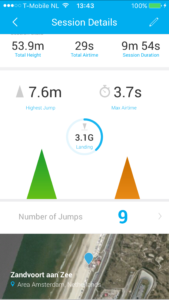 Latest version of the app shows all individual jumps. Good question. We found a work around to get the data. Since we don’t know if this is legal we cannot share it with you. 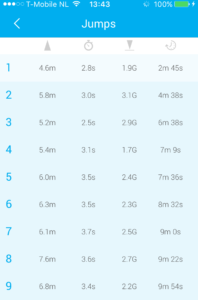 Hi, how can I get data for individual jumps from PIQ sensor? And thanks for the big compliment! I agree with Duncan. Lets have a real life test. Mayby lasers from construktion industry. A laser on a tripod. Set on the beach. Messuring from lovest to highest point. sure! We are interested….but make sure that the test is close to 100% accurate. Camera’s with angled view for instance make to big of a mistake…. It all very well saying that they are accurate when compared to themselves and each other, the important thing is testing to see if they are accurate to the real world. I have worked out a test for this if you are interested. Thanks for asking. Maybe the review is a bit short on explanation, but the results are not to compare to the reality but to other devices that measure height. 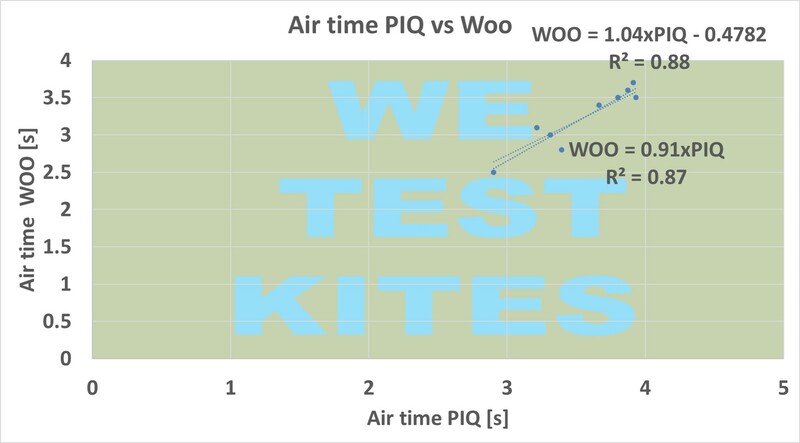 In this case we have seen a nice correlation from the PIQ to the WOO. This means data is comparable from these devices. Nothing more and nothing less. It would be great to design a graph with knots,, body weight , kite size and the jump you can except in height. 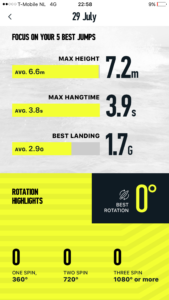 In order to jump 10 meters, weighing 190 pounds ,, how much wind and kite do we need?